The UK government has offered MSPs assurances that post-Brexit trade deals will not put food standards and protections for the NHS at risk. MPs are working on a Trade Bill to set out how the UK will do business around the world after leaving the EU in 2019. UK Trade Minister George Hollingbery told MSPs that standards would not be compromised to secure free trade deals. But Scottish Brexit Secretary Mike Russell said leaving would "immensely weaken" the UK's position in talks. 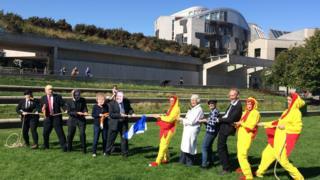 Protesters gathered outside the Scottish Parliament to raise concerns about the issue, with people dressed as chickens engaging in a tug of war against others wearing masks depicting Theresa May, Trade Secretary Liam Fox, and US President Donald Trump. The Scottish and UK governments remain at odds over the EU Withdrawal Bill, the first big piece of Brexit legislation, which was passed at Westminster despite MSPs refusing to give their backing to it. Scottish ministers have said they will not put future Brexit bills forward for consent votes at Holyrood until this row is resolved. Mr Hollingbery gave evidence about Westminster's Trade Bill to the finance and constitution committee at the Scottish Parliament. He said he acknowledged the "principled objection" Scottish ministers have over consent, but said he was "confident we will reach a position which this parliament will support". The MP added that there was "room for negotiation", saying the UK government was "absolutely committed" to engaging with MSPs to "find our way through this". Questioned by Tory MSP Murdo Fraser on post-Brexit trade deals, Mr Hollingbery said the government was "absolutely clear" that "we are not going to be dropping our food standards" to do a deal. He said: "These are things which we will not be negotiating away in any free trade deal. "As to how it could be dealt with within a free trade deal itself, that will all be a matter for negotiation - there are offensive interests, there are defensive interests, there are some things you refuse to accept, there are other things you may have to give and all that in the end will come out in the wash."
Mr Hollingbery also said it was "not true" to suggest that any deals "will end up creating issues for the NHS", saying: "In all trade deals we strike, the right to shape public policy is absolutely clearly protected, and will be in future. We will not be signing any deals hat don't have that protection in it." Mr Russell subsequently told the committee that he did not accept this position, saying the new trading system would carry a "danger" of goods like chlorinated chicken being imported to the UK. He said the UK currently has the weight of the EU on its side over such products, saying that leaving the EU would "make it considerably easier" for protections to be watered down. He added: "The changes to the system will immensely weaken our ability to stop those things happening." Mr Hollingbery was also questioned by SNP MSP Emma Harper about "geographical indications", measures which protect locally-sourced goods like Scotch whisky and Ayrshire cheese. The MP said the issue was "not straightforward", saying that while there was "absolutely no question" that industries like whisky must be protected, some countries see geographical indications as barriers to trade. Ms Harper said this response was "extremely concerning", saying it suggested that "certain interests will be bargained off in negotiations". The UK minister was pressed on what involvement the Scottish government and parliament should have in future trade negotiations. He said that devolved administrations could help "shape" trade policy via "extensive" discussions, and said his department take such submissions "extremely seriously". However he stressed that international trade was a reserved area where Westminster sets policy for the whole of the UK, with Scotland represented in this process by its 59 MPs. Mr Russell argued that the devolved administrations should be represented in trade talks, saying there was a "constructive case" for "substantial change" to the current devolution framework as a result of Brexit.